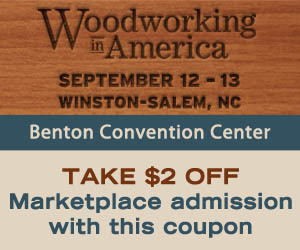 As many of you know, I had originally announced I wouldn’t be in attendance this year at Woodworking in America. But thanks to the folks over at Highland Woodworking I will now! Click on this picture, print it and bring it with you if you’re planning to only visit the marketplace! I’m so excited to be going that I know it’ll be impossible to sleep over this last seven days until I’m off the plane and checked into my hotel in Winston-Salem, North Carolina. Woodworking in America has always felt more like a family reunion to me than an educational conference, but don’t let that description fool you, you will learn a ton of great woodworking information from an amazing line-up of instructors. Instructors like Roy Underhill, Don Williams, Peter Galbert, Frank Klausz, and many more. Including of course, the editorial staff of Popular Woodworking Magazine and one of my friends who’s making his WIA inaugural appearance, Wilbur Pan. In case you’re interested, Wilbur will be teaching a class or two on Japanese tools. A topic I know an inversely proportional amount about compared to him! If you haven’t bought your tickets yet there’s still time. Online registration closes on September 7 at 11:59 PM EST. However, you can still register for the show when you get to the Benton Convention Center. You can choose from a one day, or a full weekend conference package. As there is every year, the woodworking marketplace will be open both Friday and Saturday. With over 60 exhibitors selling tools you may have only seen online or didn’t even know existed. It’s a great opportunity to get some hands on experience with them and decide if it’s something you simply can’t live without! For more information, including links to register for the event, class times and descriptions, along with a list of optional “extra” events happening on Sunday to round out the weekend, visit the Woodworking in America website by clicking here. Tell them Matt sent you! And of course, send a big thanks to the folks over at Highland Woodworking for making my trip possible.